Argalastì is the main village of South Pelion (one of the best places to stay in Greece, in my opinion), and it’s situated on the main road that goes to the other southern villages. Once arrived on the crossroad of Argalastì, you can turn left for Paltsi, Xinovrysi and Melani, or continue straight ahead for the villages of the Pagasetic Gulf (Chorto, Milina) and some villages on the Eagean sea (Platania, Kastrì, Katigiorgis), as well as Lafkos and Metochi. The center of the village is situated on the right side: the church of Saint Apostles Peter and Paul with a marble bell tower and the square (after an uphill). 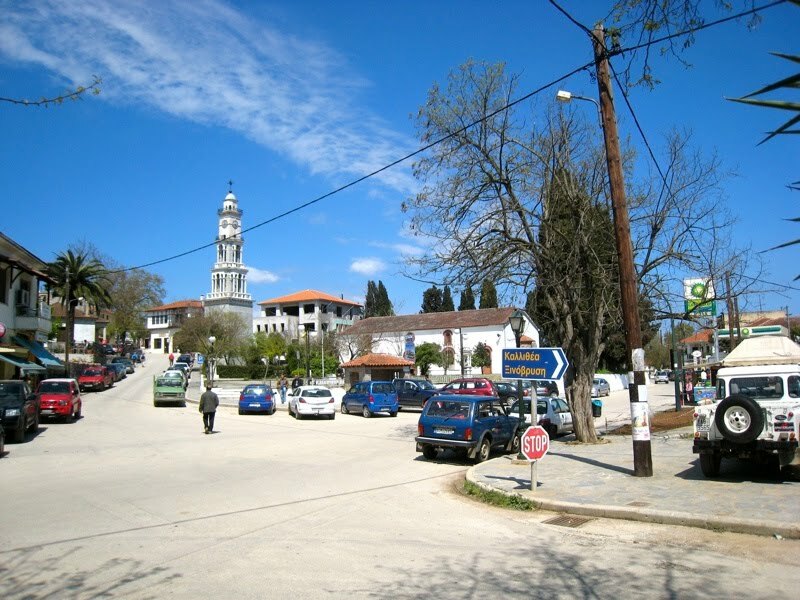 Right on the crossroad, on the left side, you’ll find the “Sto Stavrodromi” taverna. This is the place I enjoy most during my vacation (I love the Pelion diet) and the people who own it are close friends of mine (tell them I sent you there and you may get a special treatment). My favorite Souvlaki shop is situated right after the square. Giorgos makes the best pita I’ve ever eaten. Do yourself a favor and order a Souvlaki pita and a Gyros pita as well, but remember that it’s open just in the evening. There’s another Souvlaki shop on the main crossroad that opens early in the morning and serves also coffee and cakes. It also sells bus tickets for Volos or other villages. There are two modern bars in Argalastì: one is Finikas, on the uphill to the village square. Ask Apostolis to go to the first floor for a nice view of the village. The other is Deep Green, on the road to the village. You will recognize it because, well, it’s lighten up with green lights. Both stay open till late or, as the owners say, “Until there’s people”. It happened sometimes to me to leave the Deep Green at sunshine. After the village there also another place that’s open till late, with a soccer field that you can rent for playing with friends. Behind the square there’s the ancient part of the village. You can have a walk by the small streets and take a look to some pretty old houses. You can also see the Pagasetic Gulf. Remeber to be there on Saturday for the street market!